Now available for Apple iOS and Android mobile devices, AutoManager Mobile frees you from your desk and makes everyday inventory tasks both fun and simple. Using the AutoManager Mobile App, you can scan and add new inventory, take up to 100 photos, run vehicle history reports, and search your lot for the right car; all from your phone. This can be used for iOS and Android mobile devices and condenses some of the most useful features in WebManager into a package you can take to the lot, your home, or even the auction lanes. Learn how to use the AutoManager Mobile app for iOS (Apple iPhone & iPad) devices. 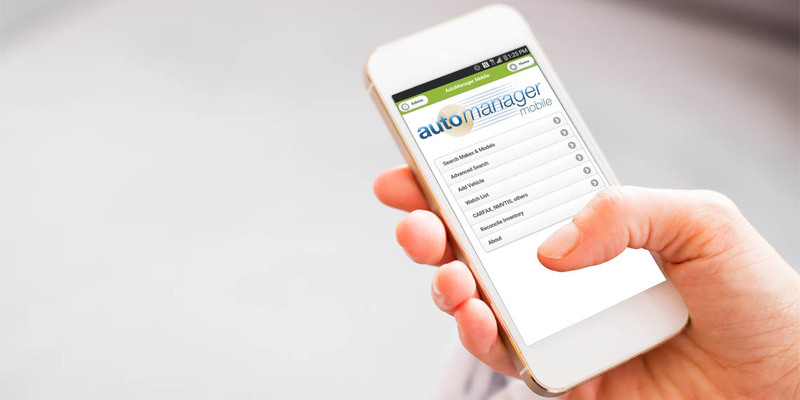 Learn how to use the AutoManager Mobile app for Android phone and tablet devices. Point your phone at a vehicle identification number and our app identifies and decodes the vehicle’s basic specs in seconds. With another slide of your finger, you can do NMVTIS history checks, log new inventory in WebManager, or even run CARFAX & AutoCheck reports. AutoManager Mobile uses advanced VIN-scanning technology developed by RedLaser, a segment-leading mobile app with over 15 million downloads worldwide. *Requires a WebManager subscription or free trial.